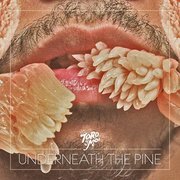 Toro y Moi is the odd moniker for one man band and sonic child of Chazwick Bundick (he must have been given names), and "Underneath The Pine" is his second album a year after "Causers of This". Under this nickname, Bundick was making bedroom recordings since 2001, he was then 15. Eight years later, he appeared on the international scene with an album which create a little buzz if not some hype in the indie area and was immediately marked as being part of some sort of 'new' musical genre called chillwave or glo-fi alongside bands like Neon Indian, Washed Out and Memory Tapes. Indeed, "Causers of This"' esthetics ain't so far from these mentioned bands : effects processing, synthesizers, sampling, looping with filtered vocals and simple melody lines (1). Their influences are quite similar too : 80s synthpop, which these bands seems to filter through distorted lens to give some very psychedelic effect (hence glo-fi, like in 'hypnagogic'), early 90s shoegaze and lo-fi, late 70s ambient and some floppy disco beats (1). But to me, the most striking element in this general genre is the vocals, they are not only filtered through different sound effects, they are mostly surprisingly bland. Taking all those aspects into account, the music that should come out must sound terribly boring, mild, insipid and shallow, well it's a bit shallow, but not more than 80s synthpop, but above all most of these bands, and surely Toro y Moi, are delivering very enjoyable and even colourful music. It's like some miracle is going on, although not really. These bands are also heavily influenced by contemporary sample music, hiphop, cut-up technique and even musique concrète, it shows some incredible musical education and curiosity, but best of all their music wins against most of their own main sometimes cheesy inspirations exactly thanks to their very punklike do-it-yourself spontaneity, plus a strong talent for hooks, means catchy passages appealing to the listener that got him or her, indeed, hooked to the songs. Toro y Moi's first album "Causers of This" contained all the above mentioned aspects, but everything remained latent, maybe because it was somewhat drowned into delightful if distractful sound wizardry à la Flying Lotus bordering on psychedelism, the whole album sounded rather 'watery', and Chaz Bundick could have called it "Washed Out" if it wouldn't have brought some confusion with the band of the same name. "Underneath The Pine" contains all the above mentioned good aspects without much of the bad ones and near nothing sounds soaked wet. The whole affair also seems closer to the result of a band effort, less that of some genius kid playing with his computer and vintage analog synths. The album opens with the digressive and spacey instrumental "Intro Chi Chi", a heavily processed tune, with light Marvin Gaye's "Mercy, Mercy Me"'s conga loops and easy listening shoegaze guitar imitation, a track which sounds like some chillwave cliché with the charms of French band Air. It could have been a leftover from the previous album, only the sounds are more distinctive, clearer and better produced. The second song "New Beat" (2) (second single, and no new beat) shows a different side of Chaz Bundick, the Afro-American thru his dad, with disco-soul music from the late seventies, but re-interpreted with mutiple layers of analog synths, some Rhodes piano solos, bumpy basses and that lazy voice of him. It could sound bleak, it doesn't, just like in the explanation given above. These funky-soul elements are even more noticeable in the song "Still Sound" (3) (first single), a mix of a better version of the 80s band Imagination meeting an after hour Earth, Wind & Fire without the horns. Rhythmically, Toro y Moi is getting closer to Curtis Mayfield on that one, while the whole synths arrangement ain't too far aesthetically from Stevie Wonder's mid 70s 'classic period' (albums "Talking Book" and "Innervisions"), while the vocals are completely devoid of soul, sweat and balls. Chaz Bundick sings these songs like he would hum in his shower or half dreamy half asleep in his bed, it's the voice of someone who doesn't give much of a dime, there's something of Beck's mid-90s most slacker period in his attitude. Where classic disco-soul is urging you to get on the dancefloor and 'travoltaing', Toro y Moi invites you to lazily sway about in your bed. Even if Chaz Bundick distanciates himself from that chillwave thing by incorporating warmer funky-soul sounds in his music, this is still completely chilling. It's only in the album's closer and longest track "Elise" that Chaz Bundick seems a little more enervated, I mean, he's almost shouting over jumpy but lo-fi African electric guitars. Musical instruments are also more audible is this second album, like the acoustic guitar intro in the soft psychedelic ballad "Before I'm Done", whose atmosphere oddly recalls Welsh bands like Gorky's Zygotic Mynci or a sweeter Super Furry Animals if that's possible. Some acoustic piano, or what sounds like it, appears at the beginning of "Good Hold" until the drums come in while the synths thicken and the vocals go softly "tadada tadada dada" not unlike the space age bachelor pad of English band Stereolab. The later are an especially odd but very important influence on this second Toro y Moi's LP, mostly on the three successive songs "Got Blinded", "How I Know" and surely "Light Black" with its very nice and hypnagogic coda, from the motorik rhythm, so lazily played it's paradoxically groovier, to the multi typical synths layers, but with these close to cheesy always efficient near pale disco vocals. Strong influence, but distilled in a very personal and imaginative way. When trying to describe this album, I realize that all this doesn't look very appealing, I mean, this record seems like a mix of the cheapest music styles ever created by mankind, against all odds, Toro y Moi has succeeded to make his own rich and enjoyable trademarked cocktail out of them, a very summerlike and sugary cocktail which you won't get too easily tired of even after several listens.